Things to know that will help you preserve the beauty and longevity of any rug. Use only low-level suction to care for and preserve your rug. (No beater bar vacuums or powerhead attachments!) Do not vacuum rug fringes. Vacuum in the direction of the nap. Rotate frequently to equalize any effects sunlight may have on your rug. By using most standard window treatments you can minimize sun exposure and thus helps to protect fine rugs. A quality rug pad is always a good idea because the pad will help reduce wear, especially in high traffic areas. A rug pad not only protects your rug investment but it also protects your floors as well as the safety of guests, friends and family who will be walking on your rugs. Immediately blot any liquid spills with white paper towels or clean terry towels. Blot only. Do not rub, because doing so pushes liquids deeper into rug fibers and causes a stain. Silkette™ is Kalaty's trademarked name for the silk-like viscose yarns used in many of the company's most luxurious rug designs. Some of our finest rugs are made entirely of Silkette™, while others are made of a combination of premium wool and Silkette™. 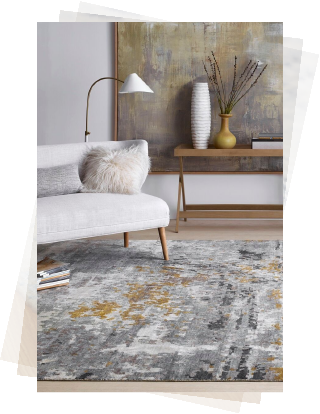 Silkette™ rugs and combination wool-Silkette™ rugs are an ideal choice for rooms and areas where moisture is not an issue. Vacuum often (no beater bar vacuums or powerhead attachments) and refer to our general maintenance tips for all rug types. For any liquid spills, use white paper towels or clean terry towels and blot immediately (do not rub). Use a qualified professional when cleaning is needed. Wool is the world's most popular fiber for area rugs ... and has been for centuries. Wool is natural, sustainable, plentiful, and, with proper care, our superior quality wool rugs give you a lifetime of beauty and enjoyment. To maintain and preserve a wool rug's beauty, vacuum often and refer to our general maintenance tips. Do not vacuum rug fringes/brush only. Prevent moisture damage by ensuring that wool rugs regularly receive indirect light and air. You may notice over time and use what is referred to as "sprouting" of yarns above a rug's surface. Sprouting is normal and not a flaw. Nor does it affect a rug's durability. 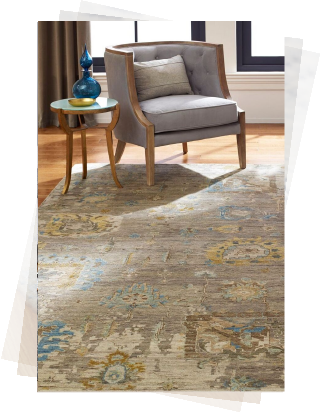 If you see yarns "sprouting" above the surface of your rug at any time during the life of your handcrafted rug, do not pull out the yarns. Pulling yarns out can cause permanent damage. Use scissors and carefully clip each piece of yarn level with your rug�s pile height. Do not store in a humid, damp, or poorly ventilated room because doing so may cause mildew, discoloration and weaken the rug. Do not store in a hot closet. Heat can damage and weaken your fine rug. If you do store your rugs, inspect them frequently. FOR MORE DETAILED CLEANING INFORMATION, DOWNLOAD OUR GUIDE TO STAIN TREATMENT & STAIN REMOVAL here.